The DDG of Fisheries, Ms Greta Apelgren-Nakardien, announced a new timetable for the allocation of fishing rights today. Picture of the timetable below, courtesy of Colleen Jacka, editor of Maritime Review Africa. It is incredible that this department thinks that we are as gullible as they are illiterate in basic South African law and fishing rights allocation processes. Their “amended” timetable firstly contradicts what the DDG herself stated at the press briefing today (28 February 2013) regarding the appointment of a service provider to oversee the allocation process. The DDG stated that she hoped the service provider to oversee the allocation process would be appointed by June 2013 (that is realistic). The original timetable published last year stated that the service provider ought to have been appointed by November 2012. Despite the fact that the appointment date for service providers in the two versions differ by more than 7 months, both timetables show that rights will be allocated by September 2013 – that is in 7 months’ time! Now that is incredible. But the amended timetable proceeds from the premise of appointing a service provider in March 2013, which is obviously impossible because the DAFF presentation to Parliament on 19 February states that it must still “re-work bid specifications” for the tender to appoint a service provider; “advertise” the tender; “evaluate and adjudicate” bids and then only appoint the service provider! In other words, by June, as the DDG let slip herself! Clearly, the amended timetable is premised on a fallacy; an impossibility. Which then means the remainder of the amended timetable is, quite frankly, nonsense as well. Assuming DAFF is permitted to ignore all legal prescripts for the appointment of service providers and that one is appointed by 30 March 2013 (and assuming the tender is published in the Gazette tomorrow – 1 March 2013) and service providers are given 30 days to put together a detailed and complex proposal on how they will oversee the rights allocation process, where are the draft policies for public comment; where are the draft amendments to the 1998 Fisheries Regulations and the Marine Living Resources Act; where are the promised draft Rule Books for industry comment? And where are the draft fisheries policies that were supposed to have been published in January 2013, including the proposed amendments to the General Fisheries Policy of 2005 (and concomitant amendments to the Regulations and MLRA), and what about organising and conducting public consultation processes between Port Nolloth and Richards Bay in March 2013 (according to their own timetable), then analysing and incorporating the proposed changes into the policy scheme; then preparing the entire policy scheme for approval by Cabinet (which in itself is a 5 month process); then gazetting the whole lot; and then inviting applications for each sector; evaluating thousands of applications and allocating rights in …. 6 months! This is the same department that took more than 2 years just to draft the as yet unimplementable Small Scale Fisheries Policy! This policy has been on the statute books for 12 months and the department is still scraping the barrel for ideas on how it can implement this fatally flawed policy – hence the continued allocation of Interim Relief fishing permits (and we are currently in the 7th year of this “interim” process – it might as well have been called the “interim-long-term-relief process”)! Remember, they were supposed to have finalised draft amendments to the MLRA and Regulations last year. Alas! There are no proposed legislative amendments on the 2013 Parliamentary calendar. What is incomprehensible to us is why DAFF continues to (dishonestly) insist that it will allocate fishing rights before they expire at the end of the year. Why cant they just be honest; admit that they will only be ready with final policies and applications by February 2014 and rights will be allocated by the third or fourth quarter of 2014? The fishing sector urgently requires some level of professionalism, honesty and integrity from DAFF. Is that too much to ask for? Feike has made the Opinion Pages in this morning’s Cape Times (iol.co.za); the Business Watch editorial in the Business Report (businessreport.co.za); and the editorial in the Business Day. Palesa Mokomele, the Fisheries Minister’s spokesperson, writes in the Cape Times this morning that we should give the fisheries department a chance to implement its turn-around strategy. She was responding to a Cape Times editorial titled “Fisheries rots from the head” (21 February 2013). Ms Mokomele – as usual – makes a number of rather foolish comments but there are two that require an urgent response. Firstly, Ms Mokomele’s closing plea to give the fisheries department a chance to implement its turn around strategy is contemptuous in the extreme. Why is there a “turn around strategy” when we are told by Ms Mokomele and the DDG of Fisheries that Feike, the DA and the media are manufacturing and lying about the supposed crises afflicting the fisheries department? Further, the fisheries department which is led by a DDG with zero knowledge of and experience in fisheries; a fisheries department afflicted by massive numbers of vacancies and no permanent head of fisheries management; and a fisheries department that has been led by Tina Joemat-Pettersson since June 2009 has been deceiving the public about the extent of each crisis for at least the past three years. Here is another brutal fact which has been repeatedly denied to date: Based on the department’s presentation to the Portfolio Committee on Fisheries on 19 February 2013, it is crystal clear that the fisheries department will not be able to allocate fishing rights in 8 fisheries this year, threatening the future commercial viability of the squid fishery and jeopardising thousands of jobs in amongst others, the squid and linefish sectors (our oldest fishery dating back to the 1500’s). Our analysis that the fisheries department has completely imploded is not made recklessly. We simply read the department’s own presentation to the Portfolio Committee last week. Perhaps Ms Mokomele may want to read this presentation to realise just how ridiculous her request to give the fisheries department a chance to turn itself around is. The presentation furthermore makes clear that none of the research vessels are seaworthy let alone at sea! The tragic irony is that the oldest research vessel – the Algoa – was transferred to the Department of Environmental Affairs (DEA) a few months back. DEA proceed to re-appoint Smit Marine to manage the vessel, which is already fully operational, at sea and undertaking marine-based research! The only fisheries research that has taken place so far has been with the use of private industry fishing vessels. Ms Mokomele, would you care to clarify how the department’s grossly reckless and destructive management of fisheries over the past 15 months in particular have not compromised MSC certification and the integrity of the research surveys? I reiterate what I have said before (but of course now supported by the department itself – and in writing too! ): The fisheries department has imploded; it serves no legitimate purpose any longer; it certainly has failed to carry out its most basic and obligatory functions under section 2 of the Marine Living Resources Act. Fact: South Africa’s entire EEZ of some 1,5 million square miles is not being patrolled or monitored by the fisheries department which is legally obligated to protect and sustain our marine resources. Fact: The hundreds of commercial fish stocks that are harvested by South Africa’s 22 commercial fisheries are barely being researched and instead reliance is being increasingly placed on desk-top analyses and industry-sponsored vessels and resources. Fact: Every one of South Africa’s inshore fisheries are overfished or considered to have collapsed as a direct result of incompetent management and the collapse of compliance. This is perhaps best illustrated by the nearshore west coast rock lobster fishery where stocks are 97% overfished, ravaged by massive levels of illegal fishing by the ill-considered and politically populist “interim relief” operators which number some 1500 “fishers”, and the unlawful abandonment of a crucial recovery plan for the lobster fishery. Fact: Fishing rights in 8 commercial and artisinal fishing sectors must be re-allocated before the end of 2013. This will not happen due to incompetence, bungling and a failure to understand fisheries management and quota allocation processes by senior staff in the department. In 2014 and 2015, fishing rights in 10 additional fisheries must be re-allocated. Preparations for the allocation of rights in these fisheries ought to commence by June 2013 at the latest. There is no chance of this happening especially considering that by the winter, the department will no doubt be frozen stiff into inaction by crippling bouts of panic. Fact: The department continues to run a substantial budget deficit and continues to place excessive financial reliance on income generated from the sale of confiscated abalone. The department therefore has an inherent financial interest in the continued growth of abalone poaching since it profits substantially from the sale of illegal abalone. The Fisheries Department (DAFF) this morning confirmed before the Portfolio Committee on Fisheries that it is unable to implement the most basic obligations required of it under the Marine Living Resources Act. The Department’s admissions are downright startling and contradict previous (false) assertions just last week that all was under control such as the hake trawl survey (which is under control but because the trawl industry has had to take charge of the survey and use an industry vessel). In particular, the DAFF – now under the leadership of Deputy Director-General, Greta Apelgren-Nakardien – has confirmed that it has failed to undertake fisheries compliance surveillance and therefore cannot say what fish has been illegally harvested from SA waters; the research cruises have failed and are now essentially being undertaken by industry and it is plainly apparent that the department will simply not be able to allocate fishing rights this year. DAFF has admitted that its grossly negligent conduct has now directly threatened the continued certification by the Marine Stewardship Council of our hake trawl fisheries. Our EEZ is completely unpatrolled and completely susceptible to massive plundering. We stand to lose thousands of tons of high value fish such as tunas, roughy, toothfish, hake and others to poaching. DAFF also admitted that the fisheries branch will simply not meet many of its targets! Of equal concern is the admission that the rights allocation process is no less than 5 months behind their own November 2012 plan which we have repeatedly stated is not only legally impossible to implement but also practically impossible. The very first target of appointing a service provider by November 2012 has not even happened. DAFF confirmed that they must still “re-work bid specifications” and re-advertise the tender! What is perplexing is that Feike, together with various organisations, including the official opposition – the DA – have been sounding these warnings for months now and the Fisheries Minister and her cadres have repeatedly refused to acknowledge our advices; instead they have repeatedly opted to label us as “liars”; as being “alarmists”; or not worth listening to. What is a greater tragedy is that the present DDG, Nakardien – who has zero knowledge or understanding of basic fisheries management (having previously led the Northern Cape’s department of co-operative governance, housing and traditional affairs which incidentally failed to achieve some 78% of its own performance targets last year but we understand already knows who is an expert in the industry or is not!) – appears committed to stick her head in the ground and deny the seriousness of the crises before us despite the content of her own presentation. accept advice and guidance from industry and sector experts. So the sum of the Apelgren-Nakardien strategy in the face of multiple crises has been to blame the Navy entirely for the complete collapse of fisheries research and compliance (even though DAFF officials sat and nodded in agreement with everything the Navy said to the Portfolio Committee back in November 2012); to deny any crisis (but that they have crisis management plans in place! ); to cry when damning articles are carried on the Feike Blog and in the media; to insult the official opposition and to commit to “dealing” with Feike. Now that will certainly address the nadir fisheries management finds itself in. Perhaps Apelgren-Nakardien (and what is with this double barrel names – Joemat-Pettersson..?) should have also suspended herself when she suspended Lionel Adendorf on Friday. The Green Party’s Judith Sole was told for a second time that her application to review and set aside the decision by the Minister of Fisheries to allocate a TAC for the current 2013 lobster season was defective as she failed to serve the application on each of the more than 1200 right holders and 1500 interim relief exemption holders. The Deputy Judge President instructed Ms Sole that she is obliged to serve her papers on each and every one of these interested parties and that the Department of Fisheries could make available to her contact details for each of these parties. Alternatively, Ms Sole could approach the court for an order granting her an alternative or substituted form of service such as advertising her application in newspapers and placing copies of the application in fishery control officers along the coast. But a court order is required first. Feike had previously stated that Ms Sole’s application was fatally flawed on this basis alone. It is unclear if Ms Sole will persist with her application. Reward excellence in the maritime and fisheries sectors by nominating a person or company for the 2012/2013 SAMSA Maritime Industry Awards. There are a number of award categories. For more details click here. Long Term Fishing Rights: What Has DAFF Done Recently? 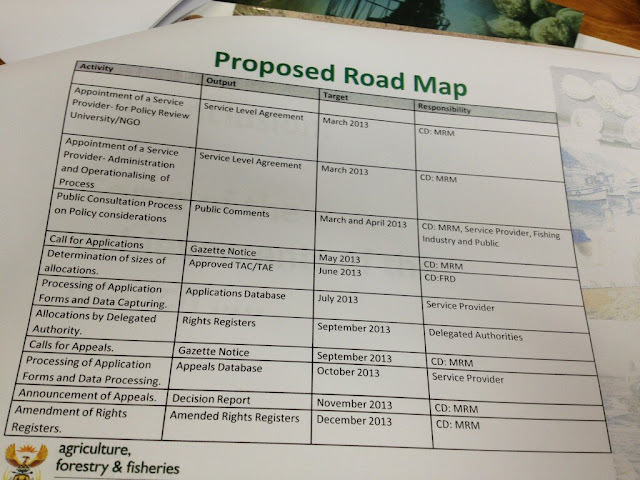 During 2012, we bitched and moaned plenty about the fact that the Department of Fisheries had done nothing by way of planning for the 2013 long term fishing rights allocation process. We also provided numerous solutions (in the beginning at least) but these became more like emergency evacuation procedures toward the end of last year as – and this is only our humble opinion – the time had run out for the department to timeously (and of course legally) allocate fishing rights. This is not to say that the department can’t allocate some 1000 fishing rights across 8 commercial fisheries as distinct as prawn trawl and traditional linefish. It can be done if one gayly ignores basic legal processes and haphazardly allocates fishing rights to those one likes most – the R800 million vessel management tender just happens to come to mind and so does a recent lobster TAC intervention! Back in November 2012, the department presented its rights allocation timetable to Parliament’s Portfolio Committee on Fisheries. Now, we have already pointed out why this timetable is extremely problematic and unlawful. The question that increasingly concerned right holders in the squid and line fisheries have (in particular) is what on earth is going on even in terms of the department’s own flawed timetable? There is no question that DAFF hates communicating with the fishing industry or for that matter with anyone. So understanding what is going on at DAFF is like asking the East German Stasi for a status update! 1. The “service provider” responsible for overseeing the long term rights allocation process was to have been appointed by November 2012. As far as we can ascertain, this has not happened yet or DAFF is keeping the appointment a secret. 2. By January 2013, all the current fishery policies (ie General Fishing Policy and each of the sector fishing policies) was to have been analysed and draft policies prepared for public comment. Again, nothing of the sort has been done unless the department undertook this gap analysis in secret without consulting industry on what their specific views are on the current policies, laws and processes and what they would prefer. (This is how one undertakes a basic gap or SWOT analysis process). 3. During February 2013, the formal public consultation process on the draft policies ought to commence. As none of the above has been put in place, a public consultation process is of course not possible (and of course there has not been any public notice about a possible consultation process for February or March). So, even on the department’s own rights allocation timetable, it is now 3 months late – at least. Feike will be providing the fishing industry with regular updates on what progress (if any) is being made on the rights allocation process as we understand how important it is that right holders are kept fully abreast of developments so as to be able to plan beyond 2013. We understand now why DAFF did not want persons such as Feike’s Shaheen Moolla and others in the farcical “consultative meeting” that was held on 1 February 2013. As we reported on 1 February, the Director of Stakeholder Liaison, Desmond Stevens, demanded that only certain persons (or representatives), including Shaheen Moolla and the West Coast Rock Lobster Industry Association – an official recognised industry body – leave the meeting. A number of “friendly voices” were allowed to remain even though they too were merely representing right holders (as one tends to do when a right holder is a legal entity!). However, back to the February 1 meeting. It emerged that DAFF is desperately trying to re-implement the OMP and recovery plan by stating that they will reduce the TAC for the 2013/2014 season but that these cuts, which will no doubt have to be rather substantial, will only be forced on right holders with quotas larger than 6 tons. We understand now why Stevens et al did not want Feike present at the meeting. For one, this proposal is wholly unlawful, irrational and arbitrary. Secondly, to foist massive quota cuts on those right holders who are the economic engines of the lobster industry and the largest employers is, frankly, stupid and indicative of a regulator who is unable to comprehend the basic economic workings of the industry. Thirdly, making such a plainly foolish proposal is another reason why it is important to first engage with industry and experts in the sector before going public and making a collective fool of one self. The proposal to only cut the quotas of those right holders with quotas larger than 6 tons would be unlawful for a number of reasons. Firstly, why 6 tons? Why not 5.5 tons, 4 tons, 3 tons or 10 tons? Such a decision appears to be arbitrary and irrational and our law does not like arbitrary and irrational decisions. Secondly, it would be unlawful as lobster right holders were allocated long term fishing rights back in 2005. And when these rights were allocated, each right holder was allocated a proportion or percentage of the TAC and this proportion of the TAC remains fixed for the duration of the right. Therefore, neither the department nor the minister is authorised to tamper with this proportional allocation as it would also have a substantial knock-on effect after 2015 when the second round of long term quotas are allocated. Two days ago the department of fisheries called an urgent meeting for midday on 1 February 2013 of all commercial right holders in the lobster fishery. The invitation called on right holders and representatives to attend. Feike’s Shaheen Moolla attended the meeting on the instructions of a number of west coast based right holders. Having signed in as a legal representative of the companies concerned, the meeting commenced. The department explained that the purpose of the meeting was to “clear the mud” in the media regarding the allegations pertaining to the lobster TAC. It is widely understood that the Minister of Fisheries unlawfully interfered in the setting of the current lobster TAC. The investigative programme, Carte Blanche, will shortly be exposing the shenanigans behind the TAC determination. It was therefore extremely surprising when – after more than 30 minutes of the meeting having commenced – and after Feike’s Shaheen Moolla stood up to ask a question of clarity, that Desmond Stevens, director of “stakeholder liaison”, demanded that only “right holders” may be present at the meeting. When it was pointed out to him that Shaheen Moolla and others present represented right holders (as these are legal entities and cannot of course be present themselves!) he demanded that Moolla and others leave or security would be called! The reality is that DAFF could not face the inevitable hard questions they would have to endure from Feike and others. In the end, the Secretary of the West Coast Rock Lobster Industry Association – the recognised industry body – left the meeting, together with other legal representatives. This left Desmond Stevens and his team to present their farcical explanations to a room of people who would agree with their explanations. They would then be able to report that they had met with the “Industry”who agreed ex post facto to the current unlawfully determined TAC. Mr Stevens’ conduct was plainly unlawful not to mention immature and indicative of a person incapable of defending his position. Feike will demand that the Deputy Director-General of Fisheries commence with disciplinary action against him, failing which we will report his unlawful, childish and plainly appalling conduct to the Public Service Commission and Public Protector. Perhaps Mr Stevens forgets that he is a civil servant in South Africa and not North Korea (which is undoubtedly from where he seeks his inspiration).